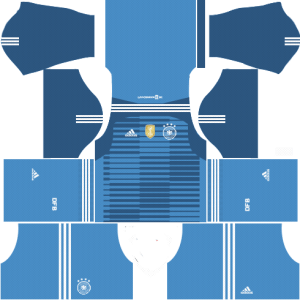 In this article, you can find and download Dream League Soccer (DLS) Germany Kits and Logos 2018, 2019 Edition with URLs. Are you a German ? 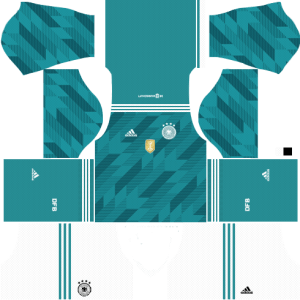 or a great fan of Germany who badly needs Dream League Soccer Germany kits to be added into the mobile game? Then this is the right place for you to get DLS 19 Germany kits & team logo. You can download Germany world cup kits and team logo using the URLs below. We all know Germany is one of the oldest well-performing football team in Europe. They have won many titles which resulted in many fans and followers and that is the reason why I come up with its customized kits (512×512) to be used in Dream League Soccer(DLS 19). Their National Team kits are so attractive. Below you can find DLS Germany kits (home & away) for the players as well as Goalkeeper. Additionally, am adding team logo too. Unfortunately, I couldn’t find the third kit. It took almost 2 to 3 hours to build the right kits & team logo. Their National kits are so amazing which they used in the last World cup held in Russia. German team uniform is manufactured and sponsored by Adidas like many other teams. All above mentioned Germany kits & logo for Dream League Soccer 2019 are working successfully for now. You can come here & download those DLS Germany kits anytime. In case any failure pop up just let me know through your comments below. Happy to help.